Batteries for vintage lorries and buses. Homepage. This page: A booklet from 1939 describing the range of large Oldham Power batteries on offer to vehicle operators. 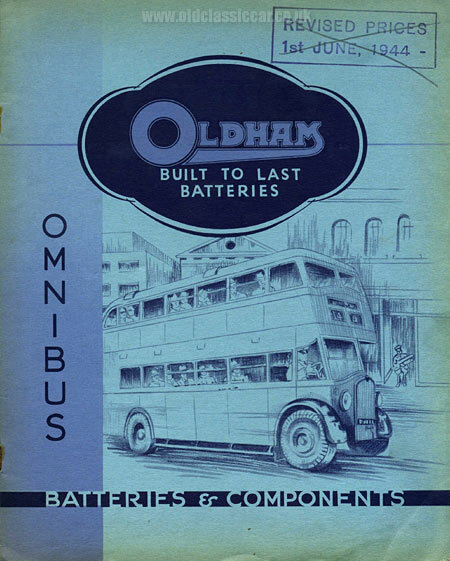 Oldham "Power" batteries for omnibuses. Oldham and Son Ltd, of Denton in Manchester, were one of the largest suppliers of motor-car and commercial vehicle batteries prior to, and following, WW2. This publication, printed in 1939, describes the range of "Oldham - Built to Last Batteries" suitable for use in omnibuses and lorries. 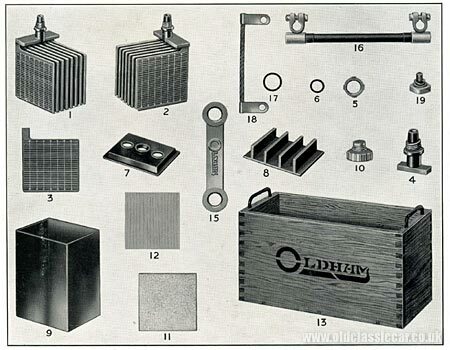 According to the introduction within the leaflet, Oldham were pioneers in the development of flat-plate lead-acid batteries, and had concentrated on this type for the previous thirty years. The plates were cast from a special lead alloy, while the separators were made from vitreous felt, reinforced by thin slices of Port Orford Cedar. The containers were built from wrapped Ebonite, "... assembled in double impregnated waxed oak trays of substantial design, all joints being interlocking dovetailed." The booklet then goes on to describe each design of battery in turn, its dimensions, capacity, weight, and price. The illustration below shows just two of the batteries on offer, perhaps a useful reference for anyone restoring a vintage omnibus who wants their vehicle's underbonnet appearance to be "just so". The battery on the left is a Type AMV unit. Vitreous felt separators, with Port Orford ribbed wood veneers, are utilised in its construction, housed within a hard rubber (Ebonite) casing. The lead bar connections - reinforced with copper - are clearly visible on the top of the battery. Prices for the Type AMV started at £10 12d 0d for the 90 Amp Hour unit, upto £11 10s 0d for the 108 Amp Hour version. To the right is one of the wood-cased batteries, the Type ML, designed to fit into battery compartments where taller batteries, such as the Oldham TL, couldn't be accommodated. The container was constructed from waxed oak, with prices starting at £4 6s 6d and rising to £18 16s 0d. The centre pages of this catalogue are given over to battery service items, and the component parts that you might have needed when overhauling an omnibus battery. These included individual replacement plates, positive and negative battery terminals, cell lids, 2-volt Ebonite jars. You could even buy a replacement moulded container for the "rubber case" models, while users of wood-cased batteries could also buy new wooden containers should the need have arisen. Information about the bus illustration. "I liked the pic of the 1939 Oldham Batteries catalogue. Very appropriately, the bus shown is clearly a Manchester Corporation Crossley 'Mancunian' streamliner of 1936-39. Fitting, really, as the Crossley factory was only a couple of miles away, in Gorton. The top-deck front windows, the 3-aperture destination/route-number arrangement, the square ventilators over the lower-deck windows (should be 3, not 4, but who's counting? ), the curve of the driver's cab window, the shape of the radiator, the near-side fuel-filler -- even the number-plate position give the game away. Only the rearmost side windows (whose bottom corners don't droop) and the roof-ventilators are wrong. I also have a strong suspicion that the sketchy building in the background is Oldham's works on Hyde Road, Denton. Manchester Corporation had 275 Crossley 'Mancunian' double-deckers with the streamliner bodywork (with very minor variations). More unusual items like this can be found in the Motoring Collectables section of the site.